Species whose size is between the darter (5 to 10% smaller) and the purple thrush (25% greater). On average its size is 25.5 cm and its wingspan between 39 and 42 cm. Mean weights range from 80 to 120 g in males and 76 to 128 g in females. In young of the year: the spinal streaks are pale on the upper parts and the spots of the lower parts are rounder than in the adult. First-year individuals can sometimes be distinguished thanks to the pale tip of large blankets (see supra right). 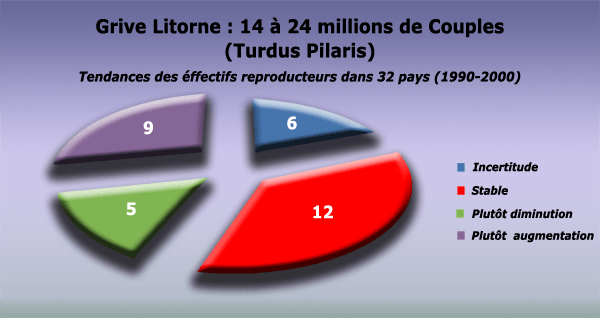 Let us add for France that the presence all the year in the canton of Nasbinals in Lozère was noticed in 1995 (Ricci and Gleize.1995) testifying to the extension of the breeding area of ​​the species in Europe. The department of Alpes de Haute Provence is the southernmost zone of its breeding area in Europe. Species of Siberian fauna category, bird of the taiga, the thrush litorne began its implantation as a sedentary species in France in 1950 in the Jura massif. Since then it has continued to colonize the more southern departments into the southern Alps and Lozere. Geographical distribution of “subspecies or breeds” : not really identified “breeds” but there are some variations in color and size depending on the parts of the range. Birds from the southern populations of central Europe are smaller than those from northern Europe: T. p.pilaris (bent wing of males 138-147 mm Vs.142- 148 mm). Brehm (1831) considers them as T. p. subpilaris. The eastern populations appear larger (wing folded 146-153mm) with the top of the head a lighter gray than the others. Some distinguished them by naming them T. p. tertius. The diet of the Italian Thrush is very varied since it concerns wild or cultivated fruits as well as many invertebrates (annelids, myriapods, gastropods, arachnids, insects, etc.). In autumn and winter wild fruits and berries are the most consumed: apples, grapes, berries of holly, juniper, bramble but also earthworms and gastropods. In the plain, apple orchards are known to be very attractive and this crop seems well linked to its distribution in winter especially when the areas of medium mountain (1000-1500 m) are snow-covered. The same is true for juniper heath (Juniperus spp) on the mid-level plateaus. In the mountains, mowed or grazed meadows are the preferred feeding habitats in which they consume most of the invertebrates (earthworms, gastropods, insect larvae, etc.). It is in the spring and summer when feeding the young that invertebrates enter a majority in its diet: earthworms (5 to 15% according to studies) but also the main orders of insects: Orthoptera, Lepidoptera (larvae) , Diptera (adults and larvae), Hymenoptera (in CRAMP and SIMMONS.1988). In England, wild apple trees are regularly eaten in autumn and winter, but the Italian thrush seems to select hawthorn fruits (87%), hence the need to conserve the environments where these species grow (wasteland, hedgerows) (HARTLEY .1954). As with most other species of Turdidae with a large ecological food niche, the diet at a given place and date will depend on the availability of the environment. Monogamous, the litorne thrush settled in late March early April on its breeding sites. The nest is placed high enough (on average 7 to 8 m). the species remains gregarious during the breeding season and breeds in small colonies where it is well established. The laying starts at the end of March, include 4 to 6 eggs. The incubation lasts from 11 to 14 days and the young stay in the nest for 11 to 16 days. On average 2 fledglings per nest and 4.5 fledglings per successful nest. Switzerland: 60-70%, independent of age. Finland: overall annual rate: 61-65%. Older known banded bird: 18 years old. According to BirdLife International (2004), breeding pair numbers increased from 12 to 19 million on average between 2000 and 2004. 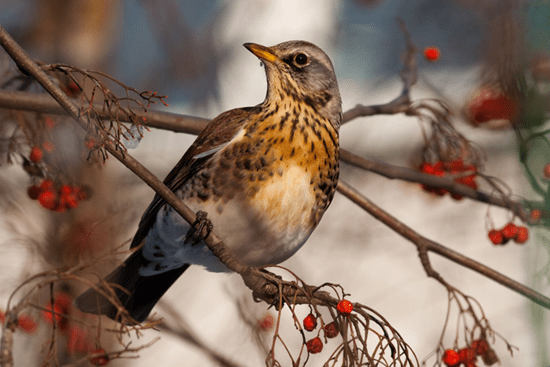 Based on these 2004 pair estimates, iMPCF estimates, considering the average production of two young per couple in Europe, that the numbers of thrushes before migration start are between 56 and 96 million individuals. 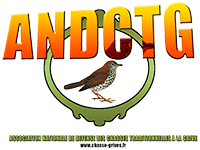 The banding results indicate that Scandinavian birds are spreading all over the country, the Balts and Russians are located south of a line Ardennes-Gironde. The Mediterranean Region is also visited by birds from Poland-Czech Republic-Germany and Switzerland. the species is characterized by irregular migratory flows from one year to the next but often linked to the pejorations of weather conditions in central and northern Europe. Young individuals are the most sensitive to cold and snow and suddenly invade regions in bands of several hundred (or thousands of individuals). These bands frequent wet meadows and lawns where they feed on earthworms, insects and molluscs. Fruits are an important part of winter feeding, hence the importance of orchards and hedges in the event of a cold snap. Further upstream, work initiated in the Scandinavian countries (LERKELUND et al., 1993, HOGSTAD .1995) on breeding strategies related to habitat fragmentation is to be developed, particularly in France where this species is in the process of colonization on its territory. 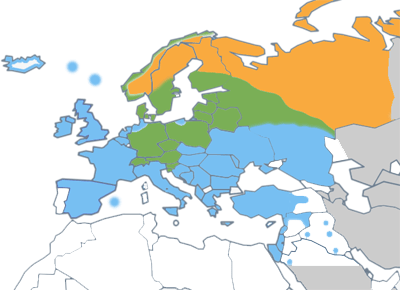 the western and southern fringes of its current range (RICCI and GLEIZE.1995) .In the wintering zone in which France occupies an important place, particularly in the event of a cold snap, it is necessary to develop precautionary rational hunting management, especially in feeding areas (orchards) which are very popular in winter. These measures are to be put in place by consultation within the framework of the Departmental Diagrams of Game Management in progress. 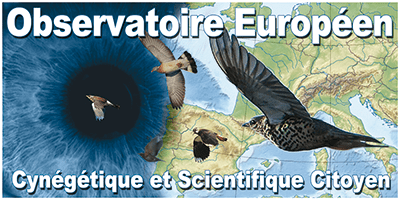 the application of measures defined in the national “cold wave” protocol is to be encouraged to fix the modalities for the momentary suspension of the hunt, if necessary, supplemented by current results on the energetics of the Turdidae as they have been obtained in other species (BOOS et al.2005). 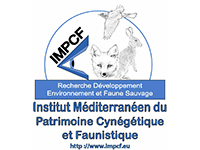 Monitoring trends in breeding numbers, range evolution in France and wintering must be supported and encouraged, in particular through the national ACT network (ONCFS-FNC-FDC) and the STOC program (MNHN ). The effects of global change on birdlife (JULIARD et al.2003) should be evaluated by intensifying the sampling pressure based on protocols adapted to the ecology and current geographical distribution of this species, which by its biology can be considered as a good indicator species.The precise knowledge of hunting by species is one of the short-term objectives achieved or in progress both in some southern departments (FDC 06-11-66) by the FNC (Universal Sample Book) or at the European level as part of the “Sustainable Hunting” program. Here, as elsewhere, it will be necessary to have unbiased statistical estimators (weighted by hunting effort and stratified sampling according to species) in order to reflect objective trends in the medium and long term. Copyright © 2019 Cybergames-café / Crédit photos Can Stock Photo / xilius. All rights reserved.